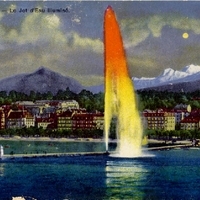 A postcard depicting the Jet d'Eau in Geneva, Switzerland, a water jet that was initially created accidentally when a pressure valve created a 30-meter high plume of water. In 1891, the Geneva City Counsel turned the water jet into a tourist attraction and moved it to the port of Eaux-Vives, where it reached a height of 90 meters and was colored by lights, as shown in this postcard. "Geneva's Emblematic Jet d'Eau. A Story. A Symbol." SIG. http://www.sig-ge.ch/en/ecoinfo/our-heritage/discover-and-visit-sig-sites/Pages/the-jet-d-eau.aspx. “Le Jet d'Eau Illuminé Postcard.” RICHES of Central Florida accessed April 19, 2019, https://richesmi.cah.ucf.edu/omeka/items/show/6608.